“A Tribute to John Denver” and Country Music Legends brings you a one-of-a-kind Branson show! Most entertainers pay tribute to artists they’ve never met; James Garrett shares music and stories from the life of someone he not only met, but a world-famous singer he called a personal friend, John Denver. Hear the stories behind the songs, like Matthew and Grandma’s Feather Bed, and enjoy hearing Denver’s biggest hits again, like Leavin’ on a Jet Plane and Rocky Mountain High. In addition to all that wonderful John Denver music, you’ll hear the songs of other country legends. Shawn Pittman, fiddle player for Roy Clark, joins Garrett on stage, as does long-time Branson entertainer and recording artist, Randy Plummer. “A Tribute to John Denver” artist, James Garrett, has an impressive resume in the industry; he’s performed with acts like Ricky Skaggs, Glen Campbell, Dolly Parton, Marie Osmond, and the Osmond Brothers. He was also lead male vocalist and rhythm guitar player for the Grammy-winning group, The Kendalls. In addition to the pop music favorites of John Denver, and the songs of country music legends, Garrett treats the audience to an excellent acoustic set, as well as a few gospel numbers. 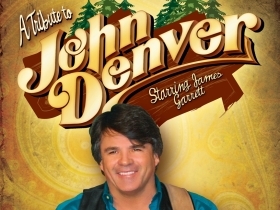 Tribute shows aren’t hard to find, but a tribute by the good friend of a music superstar is rare...don’t miss the opportunity to see “A Tribute to John Denver” and Country Music Legends by the sensational James Garrett! Contact Branson.com today for more info.